Despite industry’s mad rush to build pipelines in every direction, or maybe because of it, Canadians (and Americans) are stepping up to say no, and demanding real climate action and a different future from our leaders. 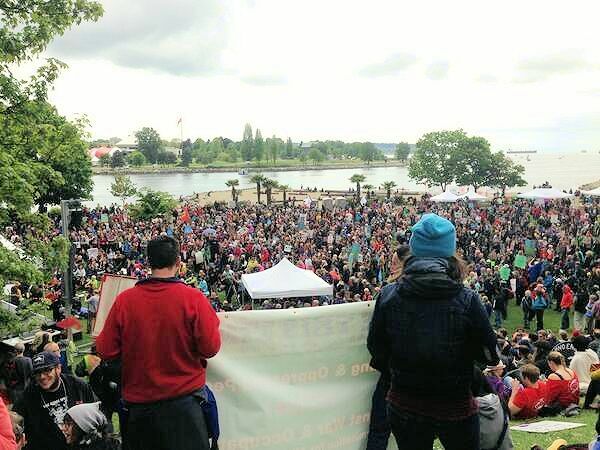 Thousands rally at Sunset Beach in Vancouver to say no (again) to Enbridge and Kinder Morgan. Saturday’s day of action happened in almost 100 communities all across Canada, and was but one stop in many years of growing protests. Did you know in one week’s time, our American friends are organizing their own day of action against dirty fuels? Let’s look at how opposition has formed around the 5 major pipeline projects proposed to expand the tar sands to climate killing levels. THE PEOPLE WILL STOP ENBRIDGE. PERIOD. Stephen Harper is set to decide on the Enbridge Northern Gateway pipeline within a month, and we all know what he’s going to do. But a united wall of opposition led by First Nations, backed by dozens of local governments, hundreds of large and small grassroots organizations, and masses of BC’s citizens will do whatever it takes to stop it in its tracks. There are at least 8 lawsuits currently filed to stop the project, many led by First Nations who have powerful treaty rights precedents on their side. Saturday thousands rallied across BC and at major events in Vancouver and Victoria to say no, again, to Enbridge and its dirty little brother, Kinder-Morgan (more on him below). You’d think that after 5 years of rallies, BC citizens would be getting tired? Check these photos and guess again. KEYSTONE IS DEAD IN THE WATER, FOR 2 YEARS OR MORE. 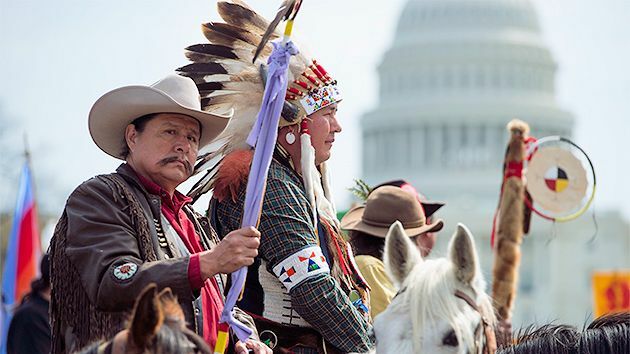 The “Cowboys and Indians Alliance” took over the US capital in late April in a week long encampment on the Washington Mall. It hasn’t fully sunk in yet up here, but word in insider circles in Washington DC is that Keystone is dead, for at least a year, probably two, and very likely forever. The impact of this win just can’t be under-stated! Industry desperately needs these pipelines to be built, fast, in order to get their dirty product to market, and this is the biggest global black eye we have against the fossil fuel industry to date. All the attention the US movement has been getting around it has solidified Canada and its tar sands as the global poster child not only for what happens when good countries get petro-state greedy, but why we need to leave extreme energy in the ground if we have any hope of saving our planet’s climate. Line 9 was the first project where Harper’s new, anti-democratic laws drastically limiting public input into decision making around new pipelines was tested. The “public process” for this giant project lasted less than 3 months, and many, many affected individuals and groups were denied any inputs into the process. This process is now under attack in two separate lawsuits in Ontario and BC, and communities across Ontario and Quebec continue to organize and fight back against Line 9. What else would get 1,500 Torontonians out on the first warm day of spring? Or check out the events in nearly every community along the Line 9 route at our last day of action last November. Energy East is a giant: bigger than Keystone, Enbridge, Kinder Morgan or Line 9. And TransCanada (a company whose brand has been irrevocably damaged in the US because of their arrogant behaviour on Keystone) is pushing it hard, as a “made in Canada” solution to the fact that no one else wants their pipelines anywhere else. The problem is, like most others, it’s not for Canadian domestic use but will be largely an export pipeline, blowing holes through 90% of industry’s propaganda about the supposed benefits for local communities. And people in Quebec aren’t exactly warmed up to Harper’s climate denial (or Harper and Big Oil in general). 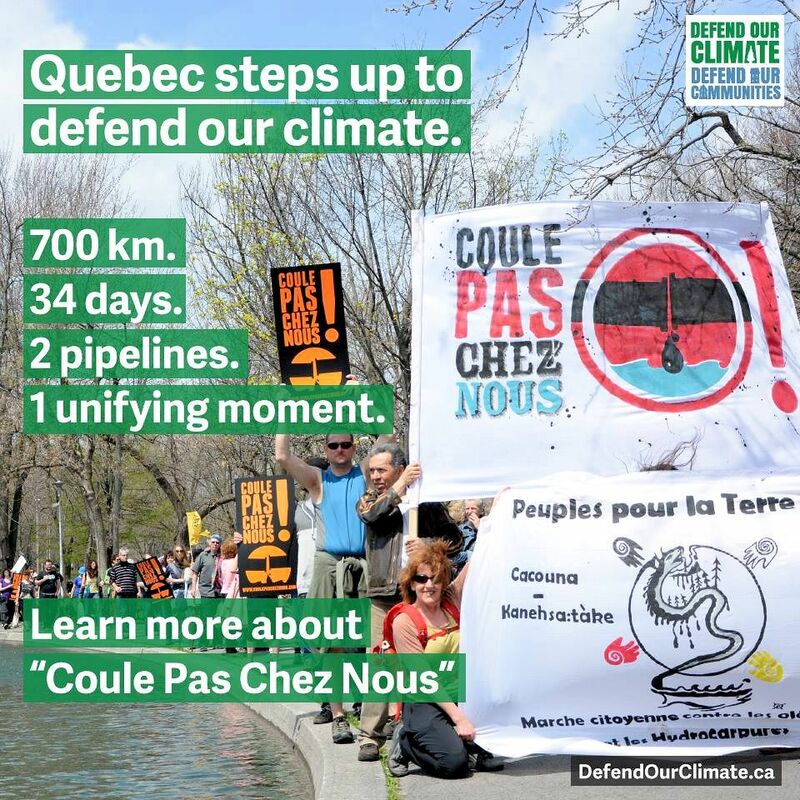 Watch for continued opposition to heat up all across this pipeline route including in the Quebec government. 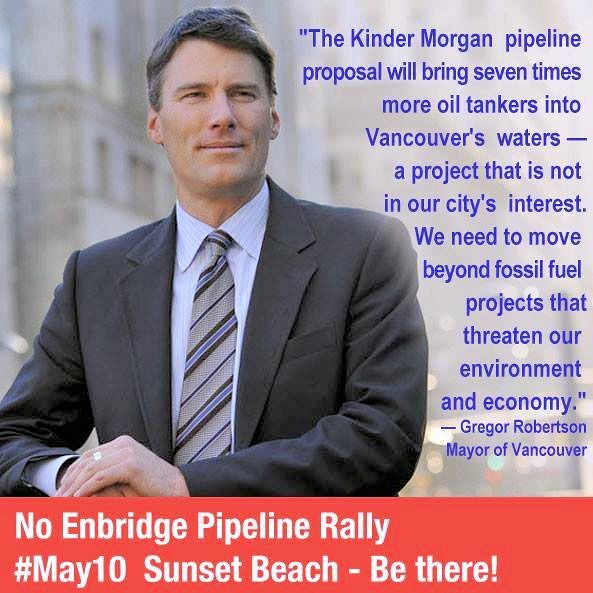 Vancouver Mayor Gregor Robertson has come out swinging against Kinder-Morgan. Rarely has a pipeline at such an early stage of its approval process garnered such a powerful opposition from not only directly affected people but local politicians, business leaders, First Nations and people from all across the region. Many regional mayors, politicians from multiple parties, First Nations communities along the waterfront, and vocal elements of Vancouver’s strong creative business and tourism communities have spoken out strongly against this pipeline that would bring 7 times more giant bitumen supertankers through Vancouver’s stunning inner harbour. 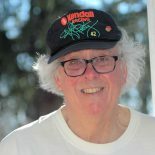 The leaders of this Enron-connected, Texas based pipeline company are trying desperately not to follow the path Enbridge did, but the truth is there is no way to minimize damage from these mega-projects. There are now at least two major court cases aiming to stop the pipeline’s approval process in its tracks. Industry and its toadies in government are literally spending tens of millions of your dollars and theirs to create an impenetrable frame around the “inevitability” that we will exploit the tar sands, and these pipelines will be built. But we the people are starting more and more to do a very non-Canadian thing: get educated, get organized, and fight back. We’ll see who wins in the end, but these days, my money is on us. Jason Mogus is a senior digital strategist, Leadership fellow with the Broadbent Institute, and one of the organizers behind the May 10 Defend our Climate, Defend our Communities National Day of Action. This entry was posted on May 13, 2014 by fjwhite in climate change, coalition counterpower, community action, demonstration counterpower, grassroots planning, Indigenous people's counterpower, information counterpower, leadership, moral & ethical counterpower, NGO counterpower, political action and tagged direct action, Enbridge pipeline, Energy East pipeline project, Keystone XL Pipeline, Kinder Morgan pipeline.